Peach is such a warm, inviting color and can really brighten up a space. We especially like peach when paired with cream, white, or tan. In this post, we’ll be sharing our top 4 peach bedroom examples. If you’ve seen a photo floating around or on Pinterest, we’d love to check it out! Leave the URL in a comment at the bottom. Want to learn more about interior decorating? Check out QC Design School’s Interior Decorating course. Click through the image links to take a look at our top picks, and enjoy! This bedroom has our favorite combination – pink, tan and white. The room feels warm and like it belongs in a home down in Florida. On chilly nights, you could unroll the duvet or simply sleep beneath the sheets on a warmer night. We like the use of mixed patterns, particularly in the bedskirt, duvet and blinds. The different saturation levels of peach keep the room looking harmonious while giving it dimension at the same time. A job well done in our books! This room is all-over peach and we completely adore it. From the orange-peach ribbon that runs across the sheet’s fold-down to the true peach curtains, the shade is almost everywhere to be seen. It doesn’t seem overwhelming, however, because of the different patterns and depths used. We also like that the bed skirt was kept simple in a clean linen ivory to keep the focus on the cushions and quilt. Oh, and of course we are just loving the flowers! We think this bedroom is the perfect option for someone sharing an apartment or living in a dorm. You don’t want to paint the whole room since you’ll just have to paint over it with white before you leave, so why not focus on painting a small section around the bed to give the room a little depth? With simple pull-down blinds and a fuzzy throw blanket in orange-peach the space feels warmer in an instant. We also like the area rug to liven up the otherwise all-white space and to make the area feel a bit warmer. 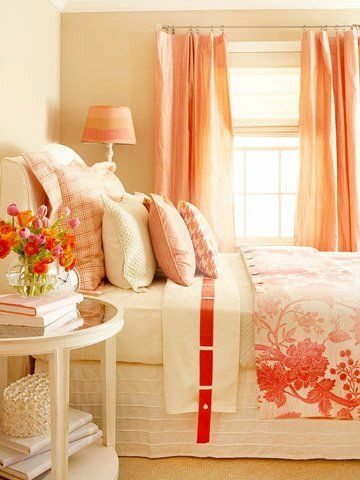 This pinky-peach room is a little girl’s dream! From the warm beige hardwood floors to feminine peach bedding and curtains, it’s truly a warm and playful space for a child. We like the matte black bed frame (and the rabbits on posts!) to give the room a little more dimension and to pull in black as an unexpected accent choice. Coupled with the faux fur rug, it really makes the space. Which peach bedroom is your favorite? Let us know in a comment! One of this coming spring’s key makeup trends is the dark crimson lip. It’s typically a fall/winter staple but 2013 seems to be switching things up a bit, and we love it! The only drawback is that winter is still lingering and our skin’s been pretty sun deprived for the last few months. Many of the ladies in the office are shying away from the deep hue because they’re worried about looking like wannabe extras in whatever vampire flick is coming up next. Fortunately, we’ve figured out how to make it work! Read on to learn how to get crimson lips that are perfect for you. Please please please take the time to apply a quick lip scrub before even thinking about trying out this look! This will ensure that the color goes on smoothly and evenly, and you won’t have to deal with any streakiness or flaky dead skin. Yuck. You can DIY it with some white sugar and honey, or you can go with our favorite product right now – Lush’s Sweet Lips. It smells and tastes like chocolate chip cookies. Yum. No matter what skin tone you have, if it hasn’t seen the sun in a while and you’re not an avid fake tanner, you’re complexion – like ours – may be lacking its usual luster this time of year. In this case we suggest opting for a lighter berry shade, as it won’t completely overwhelm your look. A stain will do nicely, as it offers shearer coverage, and extra layers can be added until the desired richness is reached. We love Revlon Just Bitten Kissable Balm Stain in Crush. It suits a wide range of skin tones and while the color is lasting, it layers very well. It’s also very moisturizing for lips that have had a rough go in the winter months. Another thing to take into consideration is your lip shape. If you have fuller lips you won’t have any problems, but if they’re on the thinner side you’ll want to opt for a lighter shade. Going dark will just make your lips look smaller, and that’s the opposite of what we’re trying to achieve! Start by lining your lips just slightly outside of your natural lip line, as this will give the illusion of a fuller pout. Then fill it all in with your crimson shade of choice. Give NARS Gloss Lip Pencil in Club Mix a try. It’s more of a gloss, which will reflect light and add the illusion of some fullness. It’s super flattering on olive complexions but it’s sheerness works for fair skin as well. Step 4: Get Your Flush On! We also want to stress how important it is to add some color to your cheeks, as it will really help to balance this dramatic look out. You’ll want to keep it subtle though, so be sure to choose a shear product and apply it with a light hand. A blush we’re loving right now is the drugstore brand N.Y.C’s Cheek Glow Blush in Westside Wine. Et voila! Now go take that chic crimson pucker out on the town! Have you found the perfect crimson hue? Share it with us in a comment!